Atef Abu Saif on life amid the bombing of Gaza: Israel’s missiles are erasing lives in an instant. The missiles raining on Gaza are reducing once beautiful lives to no more than digits. It happens in an instant, and the thought drives you mad. 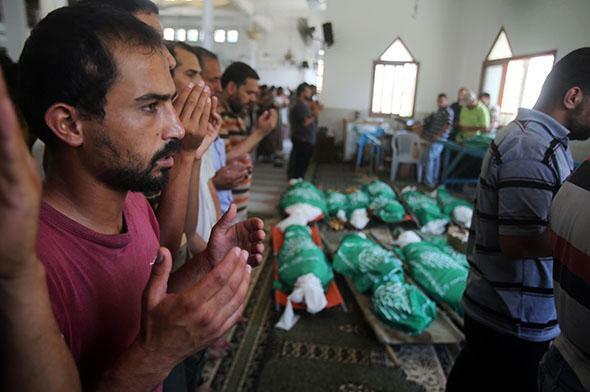 A funeral ceremony for Palestinians killed in Israeli shelling in Khan Younis on July 21, 2014. GAZA—Despite a long night of bombing, I woke early Tuesday morning to the sound of voices drifting through the window of my room, newly displaced people taking refuge in the United Nations Relief and Works Agency school across the street. In the last two weeks thousands have been forced to leave their homes on the coastal side of Beit Lahia and Beit Hanoun to avoid being killed by a shell from a tank or a warship. They have brought with them little but their desire to survive and have traveled toward Jabalia, the neighborhood I have lived in all my life. Jabalia is itself a refugee camp, established after the 1948 Nakba when thousands were forced to leave their villages and towns across the country that was Palestine. Already the most densely populated camp in the Gaza Strip, Jabalia is now receiving a new wave of refugees after 66 years. From my window, which overlooks the school, I can see old women, exhausted, sitting down on the little steps in front of the playground, their children clinging to them, many of them crying; old men are looking nervously up to the sky where drones are still hovering, making a noise that they will not forget in the years they have left. The UNRWA man is trying to organize everything in this chaos. Monday night was a terrible chapter in the history of Gaza—especially for the eastern part of Beit Hanoun. Tanks moved in from the border toward the residential areas, destroying everything in their paths, erasing every building, every school, every orchard. You do not know whether the next shell will fall on your head. When you will be reduced to another number in the news. You think about what it means to disappear from the world, to evaporate like a drop of water, leaving no sign of your existence, and the thought drives you mad. A shell killed a family of six people three days ago. Cousins of my neighbor Eyad. They were sitting around their food waiting for the prayer to break their fast. The four children were killed instantly, and the parents were mortally injured. Eyad told me that one of the dead girls vanished completely; they found no sign of her body. No bones, no arms, no legs. Nothing that might suggest it belonged to her, that a little girl of 9 years existed in this place just a few seconds ago. Apparently the rocket hit her body directly. Images fly though my head; memories are jostling for position with old songs, old ambitions, and hopes. I cannot always distinguish what is a memory and what is hope. My boy, Yaser, is trying to move slowly across the room without making any noise. I see him walking on tiptoes. He doesn’t want to wake me up. Smiling, I follow his footsteps. He takes the charger and his iPad. I realize that the electricity is now back on after a 15-hour blackout. My kids are adapting to this war—they fight eagerly every time the power comes on to charge their iPads—so they can enjoy playing on them when it drops out again. They have their own ideas about how to waste their time during the day. The first question I ask when I open my eyes is, “When is the truce?” Everybody is asking the same question. After 16 days of attacks, you wish, even harder than at the start, that it is all just a nightmare. Many times I have closed my eyes and thought, “What if I were just sleeping, and everything I saw was a dream?” I shake my head and look around. Everything looks real: The tree in the school yard moves in the wind, the sun shines, the lady next door is sitting in front of her house with other old ladies of the neighborhood, everything looks normal. No sign that this is a dream, a nightmare. On Monday, more than 100 people were killed in Beit Hanoun and Shijaia. While sitting with my friends Faraj, Abu Aseel, and Wafi in Faraj’s place, smoking nargila as we do every night, Faraj keeps turning the dial on the radio, searching the news, trying to find an announcement that might calm him down. The voice on the radio announces that the total number of people killed during the last two weeks is 567. He starts to break this number down according to where they lived, according to their ages, their genders, the method of attack, and so on. A few hours ago a shell decapitated three kids. They were carried to the hospital headless. The radio reporter continues his presentation of the situation. The number of people injured has reached more than 3,300. Some 670 houses were destroyed, and more than 2,000 were partially damaged. Everything is turned into numbers. The stories are hidden, disguised, lost behind these numbers. Human beings, souls, bodies—all are converted into numbers. While watching the breaking news feed along the bottom of the screen, you can’t help but follow these numbers being updated every minute. Before you can take another breath, the death toll changes. In the first two hours of this attack, they would give the victim’s name and keep it on the screen. Now the victims are just there as digits. The names are gone. From time to time, the total figure leaps suddenly—a meteoric leap—and then the news carries on. Imagine it. Imagine what it must be like to be converted into a number. That you are not “Atef Abu Saif” any longer; you are “victim No. 568.” You are merely a digit in a much larger number, one that just keeps on growing. Your entire life is reduced to a number. In a crowd of other numbers, the importance of every number disappears, because what is important is the Big Number. Every time the sum increases, the unwritten exclamation mark that accompanies it grows bigger, and the unheard screams that accompany each one grow louder. Journalists like catastrophes; they like numbers, statistics, data. They like the sight of tears and emotions in front of the camera. Destruction is a rich meal for the camera. Their cameras do not observe the fast of Ramadan; they devour and devour. When a human being is made into a number, his or her story disappears. Every number is a tale, every martyr is a tale, a life that was lost. Or rather, part of that life is lost; the rest tells another tale. The tale after. When a father is killed, or a mother, there are kids left behind who are not heroes, just humans, with their sadness and sorrow; they are kids who lost a father or a mother. There is a tale that is lost, and a tale that has yet to be pursued. The four children that the gunships tore to pieces while playing soccer on the beach were not the number four. They were four stories, four lives. Kawari—the family from Khan Younis that the drone prevented from enjoying a meal on the roof of their small building under the moonlight—they were not just six. They were six infinitely rich, infinitely unknowable stories that came to an end when a missile tore their bodies apart. Six novels that Mahfouz, Dickens, or Márquez could not have written satisfactorily. Novels that would have needed a miracle, a genius, to find the structure and poetry that they deserved. Instead they are tales that have cascaded into the news as numbers. Moments of lust, onslaughts of pain, days of happiness, dreams that were postponed, looks, glances, feelings, secrets … every number is a world in itself. I do not want to be a number, to be a piece in the news, a name mentioned by a beautiful TV anchor waiting impatiently to finish reading news from Gaza. I do not want to be a small number in a large one, a part of the data. I do not want to be an image among thousands of images that the activists and sympathizers share on Twitter or post on Facebook, rained down on with likes and comments. My other neighbor, Ahmad, did not want to be a number when he was killed trying to save his family in the Al Nada border area. None of the killed or injured wanted it. And nobody will ever ask to hear the stories behind these numbers, either. Nobody will uncover the beauty of the lives they led—the beauty that vanishes with every attack, disappears behind this thick, ugly curtain of counting.